NOTE: THESE CATS HAVE POWERS! BUT EVERY CAT DOES NOT KNOW, EXCEPT THEMSELVES. The cats chosen all need to go to a journey to find out what is going to happen, and it takes them 3 moons. About 3 moons later, the huge battle starts - involving everyone. PLEASE NOTE: WE ARE STARTING WITH NORMAL PLOTS, AND THE NORMAL PLOTS WILL BE HAPPENING AS THIS IS HAPPENING! There will also be a cat who has been reborn from the Dark Forest, who wants to control all the 5's powers. 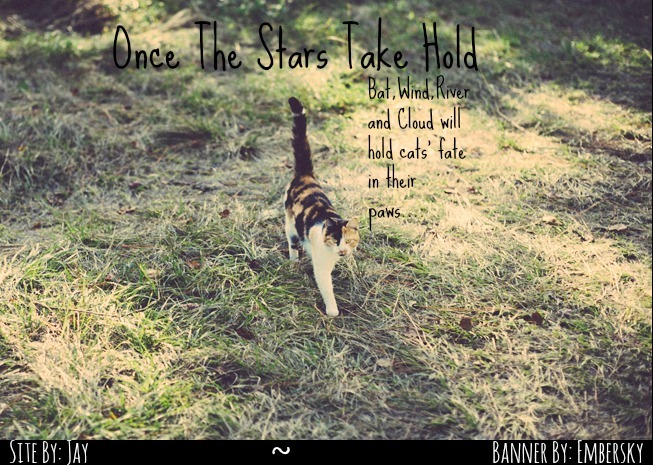 However, a cat has also been reborn from StarClan, who wants to help the 5 with their powers. The Dark Forest cat is Hvitur (Nebula) and the StarClan cat is Asteria (Me). I'll add everything else when it's done! NOTE: Ember and Nebula ONLY are allowed to post here. When the darkness comes, the light will save the Tribes. Basically what'll happen is the darkness - bloodcough - will spread through all 5 tribes. The only cure for Bloodcough is the Light Flower, which currently is found far away. The 1 to-be, owned by Embersky, will have 2 powers, and she has to use them to help her find the Light Flower, and bring it back. She or he will see the 5 Clan cats, also on their journey, and they'll work together to get to their destination, which happens to be in the same place. The to-be will then bring the flower back, give some seeds to the Clan cats - planting them in the Star Field - and save the tribes. Some time after the cats have come back from their journey, the Dark Forest will rise - in even larger numbers then ever before (trying not to spoil for people!). Ancestors upon ancestors will be fighting alongside the Clans, Tribes and Ancients. Even the rogues, loners and kittypets around the territories will fight so they don't get wiped out. The Dark Forest want to take over all the territory there, also determined to wipe out any cats that could bring the Clans and Tribes back. Don't worry, the Dark Forest won't win! What about the Tribe to-be? By the way, we can powerplay the apprentices (they are so important) if the owner of them isn't there. Why do I get only one? This doesn't seem very fair. I mean, I was here way before Nebula and helped create the site? This is irritating, can you guys please not pick things when I'm not here. What if I wanted some other cat instead? What If I wanted some nice powers too? Please wait for me in the future. You do get two. You get the other Clan apprentice, or Stellarpaw, and the Tribe to-be that is also coming for the prophecy. I also feel you kind of stole Cloud and Bat's powers...? Cloud has shapeshifting and Bat has camouflaging wings. We needed to start RP going, so that's why. You can choose names for your two - the tribe to-be and the Clan apprentice. Also, we chose first since you've taken lots of high ranks, this is just to make it fair. Also powers can't be the same as someone else's. Plus we even said you can choose the powers, we just had to put them there whilst I was powerplaying whatever your cat's name was. Also, Daisy, I didn't see the powers, but no worries I'll change those. Adding and changing name now. Also, the 5 know each other from a previous prophecy (completed), and know about their powers.